The Japanese have been recently distraught about the Tsunami which struck their lands. However people across were more concerned with the automotive loss rather than that of the lives. We haven’t heard or read of many fund raisers for these grief stricken Japanese people. The only lamentations that can be heard are that production facilities have been destroyed all across the “Land of Rising Sun”. Many companies like Nissan, Mitsubishi and also Toyota were forced to go off track for this very reason. However it seems that Honda Motors were the worst affected. The reason for this is that although Honda claims that nearly all their facilities are okay but then CBUs coming down to India have been stopped. There is almost a waiting period of 5-6 months for almost all of Honda products in India. That Honda prefers not to manufacture these products here is another part. Toyota don’t look as much hit by the Tsunami however facts do suggest that even they have suffered big losses. But then except for the Camry, production of no other vehicle has been stopped as of yet. But we Indians are in for a big loss since two of the hatches from this prestigious Japanese manufacturers were supposed to come to our shores very soon. Those two hatches are the Honda Brio and the Toyota Liva. Their launch dates have been postponed and this seems like a bit of disappointment for the Indian car buying populace. After all seeing the success that the Etios is enjoying, Toyota definitely want to capitalize on it. However the story here is of a different kind. Its between the traditional Japanese rivals, the Honda Civic and the Toyota Corolla Altis. But this war is not being carried out in Japan now but rather in India. So gear up for the Toyota Corolla Altis in India and the Honda Civic in India duel. As far as the looks go, the Honda is the more radical design. So much so that even after years of it being launched here, it still commands fleeting or even lingering glances. The Honda Civic in India and when we say India, the American model definitely has to be dismissed. It looks more like the Honda City that we have here in India. So the 7th generation Civic that we have here is one of the best one as far as its looks go. Its more like an eligible bachelor all dressed up in the finest of clothes and women just admiring him so that they can hook up with him for the night or even for life. The Toyota Corolla in India however is more of the middle aged man who has designer clothes to his credit, is rich and pompous with a fetish for middle aged women. So both the cars are different in their looks. Actually the earlier Toyota Corolla was the blandest things on wheels. That the same company manufactures the Prius with its Kammback tail is another story. However the newer Altis looks good and is far more a good looker than what the previous generation can lay claim to. Its HID lights would definitely make heads turn as far as night time driving is concerned. Of all the manufacturers out here, Honda is the only one which doesn’t carry a family face legacy here. All its vehicles look different from each other but they definitely have the Japanese look to them. While the Honda looks a boy racer from every angle, the Corolla Altis tends to lend the imposing stance. The Civic has a more radical alloy wheel design than the Corolla Altis and this would appeal to those young at heart. Out at the rear, the Altis with its bulbous sticking out LED tail lamps are a stark contrast to the Civic’s pentagonal LEDs. As far as looks go, it’s the Honda Civic which goes one up over the Toyota Corolla Altis. However if you prefer a more laid back design, then the Toyota Corolla Altis is the one to go for. 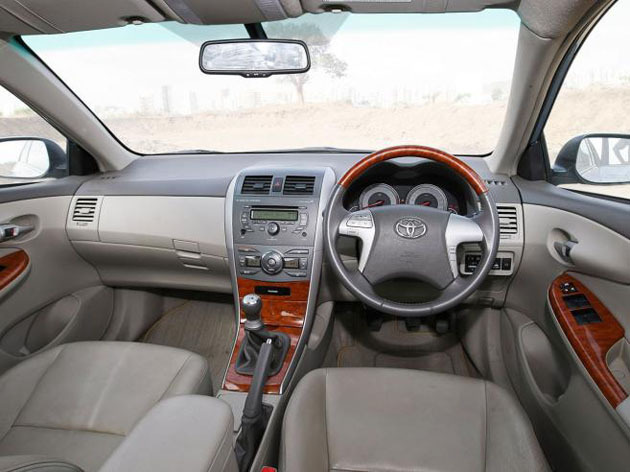 The Toyota Corolla Altis in India comes with the typical wood finish that we have come to see from almost all the Toyotas in India. Actually speaking, the Toyota has so much wood panels in it that a small tree house can be built out of it. Its dash makes use of light as well as dark plastics overall. The steering wheel is more like the Hyundai Sonata Transform with its half wood and half leather combination. It is a multi function steering wheel. The Corolla Altis also boasts of optitron meter dials which look fabulous when lit up. But if its meter dials that we are talking about then the Civic’s hybrid like blue backlit meters take the cake. Infact many of us would have at one point or the other stared at the Honda Civic’s interiors when it would be stationary at a traffic signal. 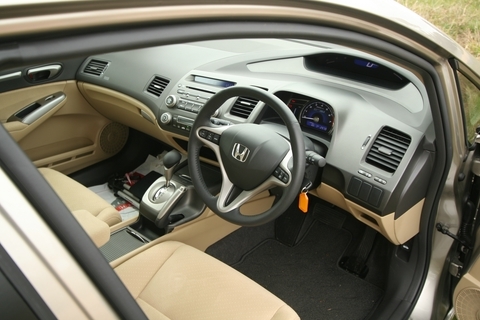 The Civic also boasts of a first class interior with the three spoke steering wheel which houses the various controls. However to get into the Civic, you note that you have to crouch lower than that in the Corolla Altis. Both the Honda Civic and the Toyota Corolla offer ample of features like climate control, monochromatic and also electronically retractable mirrors. However the Toyota pips the Civic as far as features list goes. Out at the rear, the Civic has a flat squab which ensures that sitting three along isn’t a problem however when the Corolla comes into the equation, it ensures that not much is wasted as far as passenger comfort is concerned. You sit a bit higher in the Toyota and have a better under thigh support in this car as compared with the Civic. Boot space of 475 liters may not be great in the Altis however the Civic also has the same dimensions to its boot space and hence one cannot be said to be better than the other in this regard. As far as the interiors go, the more funky one is the Honda Civic while the better one is the Toyota Corolla Altis as far as build quality goes. Moreover, the Altis feels a bit better built than its Japanese rival, the Honda Civic. The Honda Civic is setup on the stiffer side than the Toyota Corolla Altis. This manifests in the fact that the Civic goes quicker around corners and can carry far more better speeds at the exit points. 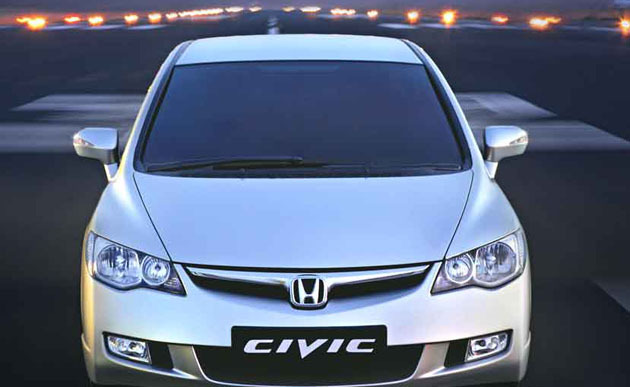 The Honda Civic in India however suffers from the time honored Honda problem of a suspension which bottoms out. Load the Civic fully and its suspension would bottom out and it would seems like that the car is actually just balanced on its wheels and there is no suspension travel left. Infact the Civic harboring on its sporty intentions has got a much lower ground clearance than any other car in India, forget the Corolla Altis. The ride quality in the meanwhile is great in a straight line however once the bumps come in, the Civic would let you know of each and every bump that came its way. Sitting closer to the ground has its own perils as far as the ride quality is concerned and the Civic’s pretensions of being a sporty car means it sacrifices the ride quality at the altar of handling. The Civic’s steering wheel is a small unit and is a delight to use. However the lack of much sound deadening materials under the hood means that the Civic is quite a noisy car at full clip. As for the Toyota Corolla Altis in India, ride quality was always its forte. Its neither that stiffly sprung and nor is it overtly soft. The chassis however doesn’t seem to be able to cope up with the mass that is there. It is more than willing to throw its occupants out of the windows, at the first sight of a corner. The steering wheel is an electronic unit and like all the electronic ones, this one also lacks the feel. It is very good to hold and while the Civic’s one may transmit some vibes via the steering wheel, the Corolla’s doesn’t. Ride quality, which is the Altis’s trump card remains so. It doesn’t transmit any bumps into the cabin and moreover NVH also has been nicely damped however while the Civic’s motor doesn’t seem to be creating a racket under the hood, the Corolla’s, if you keep the windows open, loses its composure. Everywhere in the world, Toyota cars are known for their ride quality rather than outright handling. So going fast around a corner in a Toyota is a big no-no. The best way to enjoy a Corolla is to take it on a long straight road and the Toyota would delight one with its mile munching and relaxed attitude. The Civic on the other hand has got an engine and suspension combination which begs the driver to cane it from time to time. It is more comfortable on a race track than on the normal roads. The Toyota Corolla on this one due to its superior suspension setup. It also ensures that the passengers are isolated from the roads and are wrapped around in the luxury home that it is aimed to be. The Civic delights with its sportiness however in the daily grind, its more likely to scrape its underbelly with speed breakers. The Corolla has been soldering on for ages with its 1.8 liter motor for India. Elsewhere, it also gets a 2.0 liter engine which makes about 150 Bhp of power. But then, we Indians always end up getting a raw deal. This 1.8 liter engine is the same one as the one on the previous generation Corolla. It has got 16 valves to boot for plus VVT and a good 132 Ps on tap. The torque figure reads as 170 Nm. A 5 speed manual transmission is what helps the Corolla driver with his gear shifting duties. For the Civic, it is a new 1.8 liter engine (new because the Civic is the only Honda car with this 1.8 liter engine in India while the Corolla has been living off its heritage from the past). This engine has Honda’s fabled I-Vtec for company. Mated to a 5 speed manual, this engine manages to produce 132 Ps of power, the same like the Corolla however with slightly more torque ratings at 172 Nm. The Civic is the faster car here with a 0-100 kmph timing of 11.3 seconds compared to the 11.8 seconds which the Corolla takes. The top speed stakes are also won by the Honda Civic with it reaching 186 kmph to the 180 kmph at which the Corolla tops out. Both the cars here also carry automatic gearboxes. While the Civic gets a 5 speed auto with paddle shifts behind the steering wheel, the Altis makes do without paddle shifts and has only a 4 speed ECT transmission for duties. Out of the two, the Civic naturally feels more sporty to drive around due to the paddle shifters which imitate the F1 style of gear shifting. The Altis feels the more relaxed of the two out here in the mile munching duties. The Honda Civic has an excellent brake feel however the brake bite in the Corolla Altis is better since it has bigger discs than the Civic. Both the cars come kitted with EBD and ABS as their braking aids. As far as safety is concerned both the cars are equally equipped. Dual front air bags, collapsible steering columns and also adjustable seat belts ensure that the occupants are safe, were a collision to happen. Both have reputed names for their body construction. While Honda chose the moniker as G-CON, Toyota uses it as GOA. Both essentially mean the same that the chassis is rigid and much of the aftershocks from a collision are transferred or distributed evenly throughout the structure of the car. As far as fuel efficiency is concerned, it is the Altis with a remapped ECU and engine tuning which manages to edge out the ever efficient Honda engine. The Corolla Altis petrol model returns an overall fuel efficiency of 14.4 kmpl to the Honda’s 13.3 kmpl. Noteworthy is the Altis’s fuel efficiency of 19.6 kmpl on the highway. The Honda could just manage 17.4 kmpl. First of all, if you are in the market looking out for any of these two sedans, then bear in mind that both are due for a replacement. The frenzied activity from Toyota ensures that it would be the first one coming out with a replacement. Many spy shots of the 2011 Toyota Corolla Altis in India have come up on the web and there was a recent picture with the car almost shown without any tapes all over it. Most likely the car would be launched by about June or July 2011. As for the winner of this bout, first the pros and cons. The Honda Civic is the best buy right now coz the next generation one is not so good looking and seems much like a grown up Honda City. Moreover, as with all the Honda products, it comes with a heft price tag, as can be seen from the US market. The current model has got space, pace, handling and nice interiors. Not to forget, the killer looks and the Honda badge. For its cons, it has got a low ground clearance and that means looking out more for all those speed breakers and stuff. In India, there are more speed breakers than roads themselves. Moreover the Honda has a problem with its ride quality and typically the Indian roads demand better ride quality than outright handling. As for the Toyota Corolla Altis, it has got space, nice interiors, cosseting ride quality and also fuel efficiency going its way. However the things to be discarded are the not so good handling and also grown up looks. However when it comes to the Toyota badge, few things come as close. This battle is more about the badge and which one is more prestigious Honda or Toyota. Well, this would be the right time to bargain for heavy discounts on the 2010 Altis model as the new one is due in a few months time. That is if you can live with the thought that you are getting an older model. New things to watch out for the 2011 model are a better tuned engine for more power, more goodies in the interiors and also spruced up looks. There would also be an all new transmission coming up. As for the Civic, apart from its looks, not much would change in the interiors or the power ratings. Now, the decider, the price. The Toyota Corolla Altis price in India starts from Rs 1,032,387 lakhs whereas the diesel top end model retails at Rs 14.13 lakhs. For the Honda Civic price in India, the tip is Rs 12.77 lakhs and goes upto Rs 15.19 lakhs. Enough of a difference to settle down for the Toyota top end diesel rather than go for the Honda. Well, the Civic doesn’t have a diesel engine and wouldn’t have one in the near future but it does boast of a sunroof which the Altis doesn’t offer. Our pick for the day is the comfortable Altis over the Civic. I like the Toyota Corolla Altis for me since it looks more stylish than Honda Civic though I have no problems with the performance on both cars.